Please take less than a minute to sign both my petitions to AAHA and AAFP. 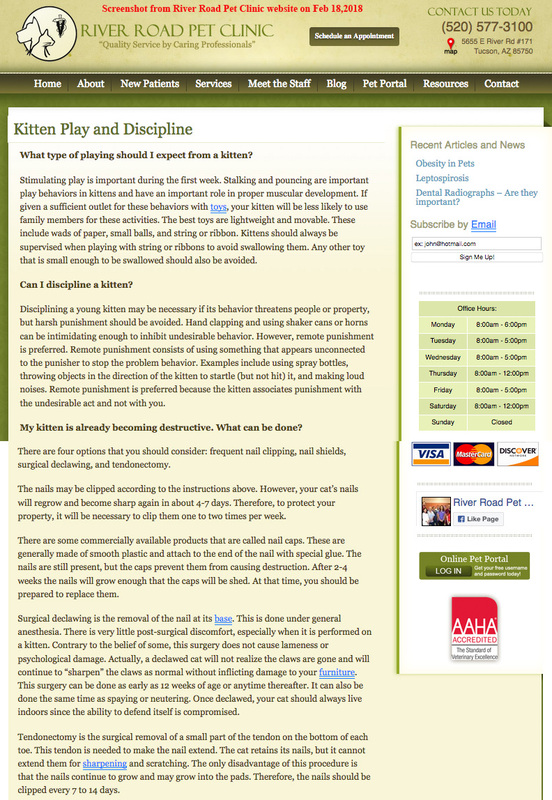 It’s concerning that this New Kitten FAQ information is being used by many veterinarians and even government websites in America. It’s also shocking that even the CAT FRIENDLY practice in Michigan, where the 2017 AAFP Cat Friendly President works, has this info on their website. Many of the vet practices using this declawing info are CAT FRIENDLY AAFP and AAHA hospitals who are supposed to be the best of the best vet hospitals with the most feline friendly veterinarians. 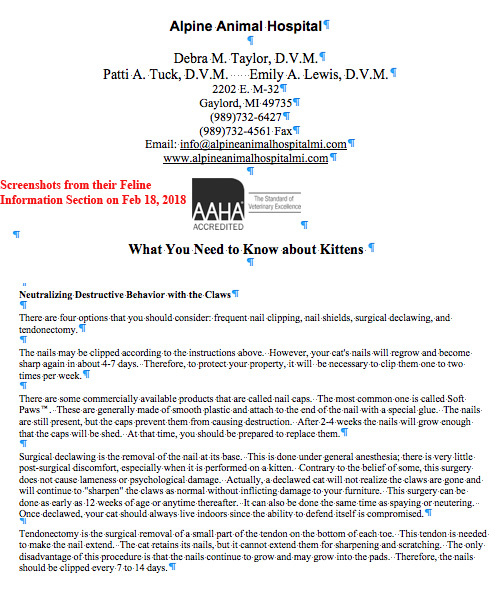 Both AAHA and AAFP are strongly opposed to declawing. Here are just a few examples of the many vet practices and organizations that are STILL using this incorrect declawing information. This is the practice where the 2017 American Association of Feline Practitioners President works. 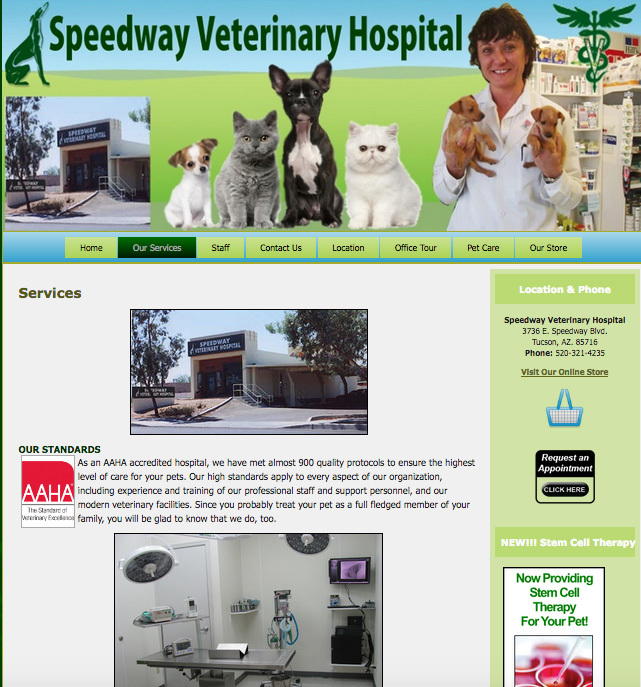 The CAT FRIENDLY Exclusively Cats Veterinary Hospital in Michigan. Feb. 22, 2018 Exclusively Cats Veterinary Hospital edited their info from the info on left to the info on the right. When a cat owner called Russell Veterinary Hospital P.C and asked for the price of a neuter and then asked if there is anything else that they suggest that can be done during the neuter procedure or that cat owners have done, the employee said that’s all unless you are worried about the cat clawing furniture. They said the only other thing some people have done is a declaw. They said the only thing that they ask is that the cat stay inside, the neuter/declaw is from $250-$378, all three of their vets do them regularly and are comfortable doing them. When asked how they do the declaws the employee said they amputate the digit with guillotine clippers. They said that in about 2 weeks the cat will recover from the declaw as long as it doesn’t chew on its toes or is too active. 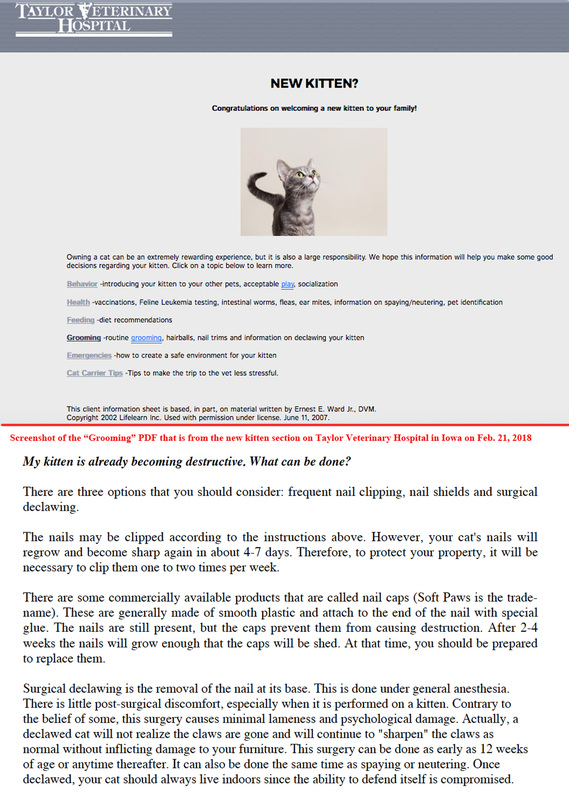 They recommend Purina’s Yesterdays News Cat litter. When a cat owner called Lakeside Veterinary Medicine and asked for the price of a neuter and declaw the employee said it is $385, all their vets routinely do declaws and do a good job at them, and they have “tools to take out the claws” which are clippers. The cat owner asked if declawing is ok and will their cat be ok and the employee said as long as the cat doesn’t jump around too much for a week. They give the cat antibiotics for 7-10 days after the procedures. They recommend Purina’s Yesterdays News litter and said you can buy a 6lb bag from them for $10.39. Here’s a CAT FRIENDLY American Association of Feline Practitioners hospital, Taylor Veterinary Hospital in Cedar Falls,Iowa with the info on their Pet Info/New Kitten page. When a cat owner calls River Road Pet Clinic in Tucson, AZ, an AAHA hospital, to ask for the price of a neuter and then asked if they also can declaw the kitty, the employee said, “Yes, we do declaws.” The employee said that they don’t do them often because it’s not something people do much anymore. 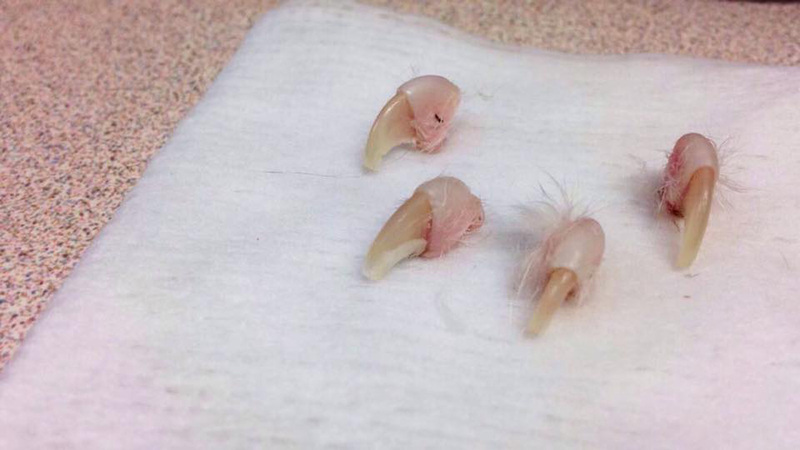 They said that it is removing the digit on their claws. When the employee was asked if their cat be ok from the declaw long term, the employee said that you just have to keep him from running around and he will recover from it. The Fort Wayne, Indiana Animal Care and Control website. 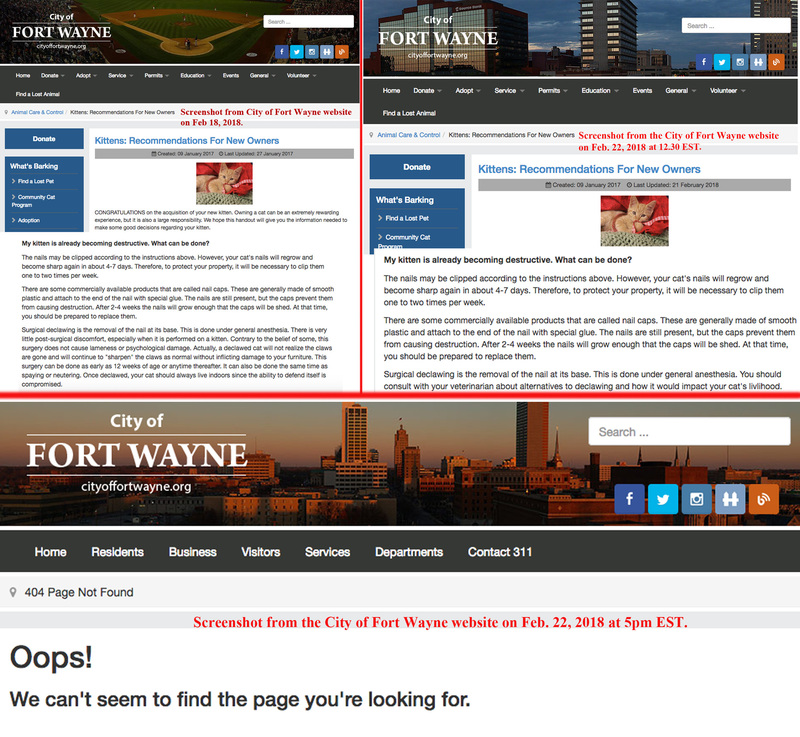 Feb. 22, 2018 the City of Fort Wayne edited this info and then took the page down after I reached out to them. They said they are discussing what type of new information to put on their website. 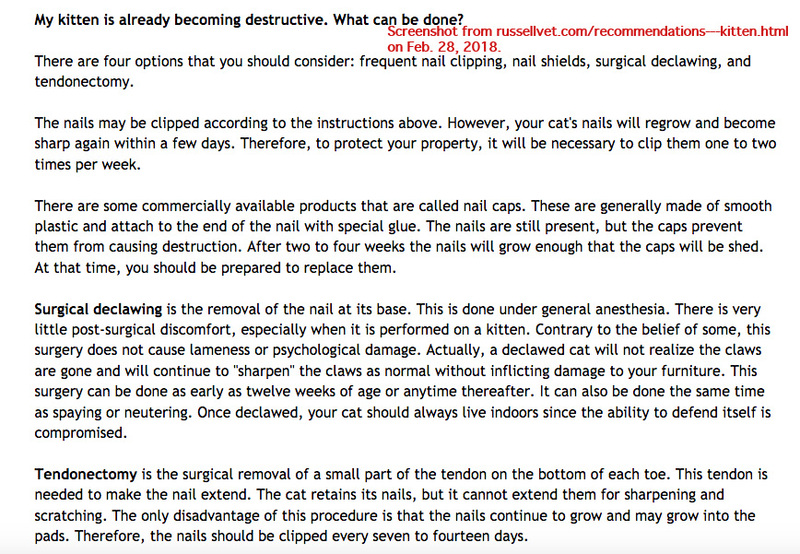 Also, I reached out to Lifelearn and asked them about this declawing info and if they would publish factual declawing info and also information about the humane alternatives and the Chief Veterinary Officer wrote this back. “Thank you for bringing to our attention the 13 year old article that you found on Fort Wayne’s website. I wanted to write you personally as the Chief Veterinary Officer of LifeLearn Animal Health. 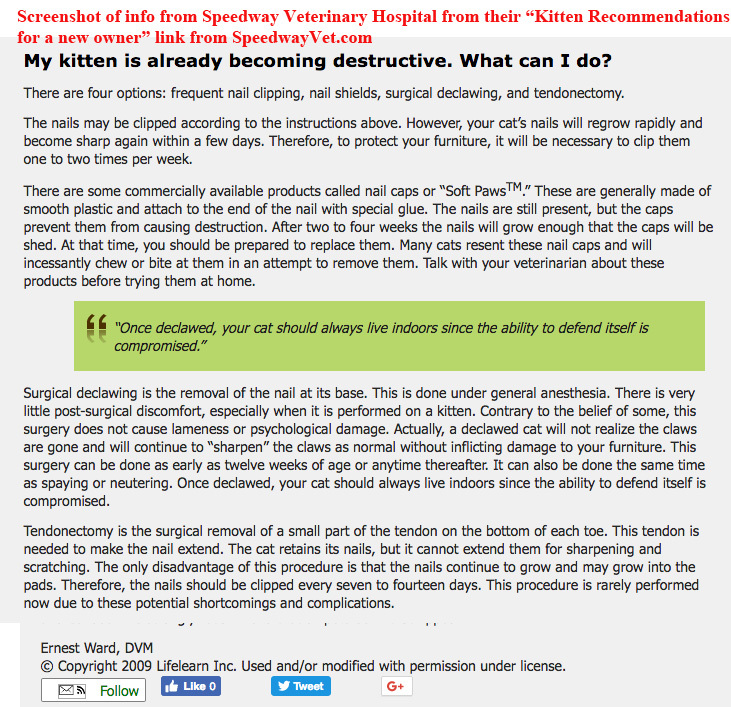 That New Kitten Recommendation article with this outdated declaw information is very old, and thankfully the profession has evolved. We removed that version of the article from circulation long ago, but unfortunately, some veterinarians have posted it without our permission. As Desmond explained, we have a process of finding older postings and contacting veterinarians to remove them so that outdated information does not get propagated. Firstly, I apologize for any confusion surrounding the source of this article. Neither Desmond nor Andru were employees of LifeLearn when these original articles were written. Thus, the 2002 vs 2005 date. Also, the original article was not written by Dr. Ward, he was part of the 2nd generation of veterinarians we used to write, edit and review our compilation of client education articles that is now over 1800 articles strong. As you can imagine, keeping up with all of this content is a challenge, but with feedback like yours, which we appreciate, we can continue to improve our library that is supplied to veterinarians to use with their clientele. 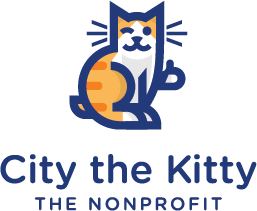 I feel that your request is a good one, and I will recommend we update our New Kitten article to include mention of humane alternatives to declawing. Since we endeavour to have our articles updated every 2 to 3 years, it is due for a complete review; however this will take some time, as we need to put this in the queue for our veterinary writers and reviewers. Once again, thanks for your communications. Fact- Surgical declawing is the removal of the last bone in a cat’s paw or the removal of part of the last bone in a cat’s paw. Fact- Cats need their claws for many aspects of their health and well-being. Fact- When declawing was invented in 1952, no studies were performed to evaluate the long term consequences to the health and well-being of a kitten or cat. Fact- Declawing is a billion dollar business in America and declawing vets make a lot of money from amputating the toe bones and claws on kitties. 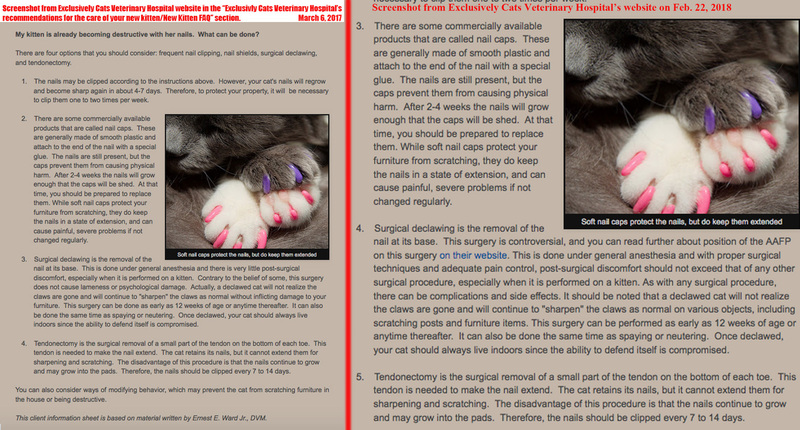 The spay/neuter declaw package is very common in declawing veterinary practices in America, especially in the Midwest.